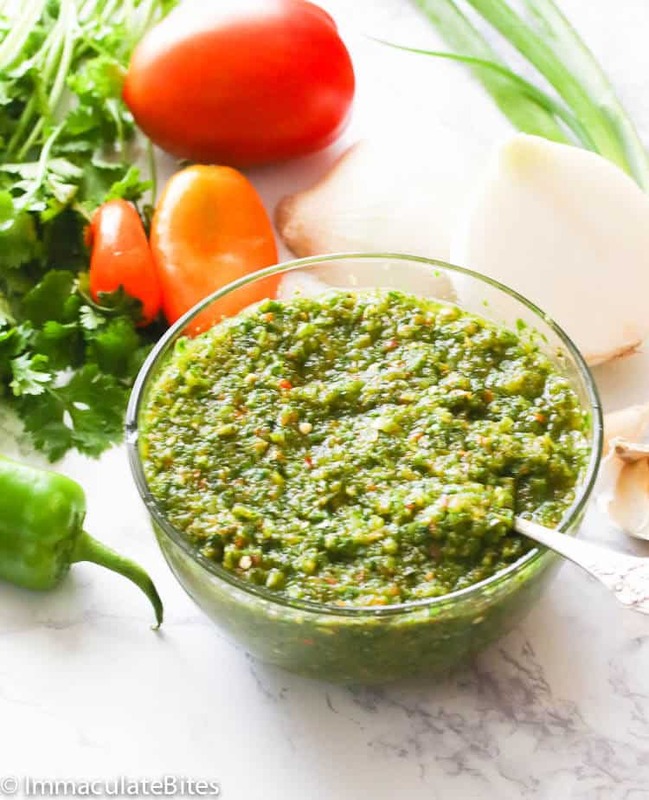 Sofrito Recipe – a versatile aromatic green puree made of bell peppers, tomatoes, cilantro, garlic and onions. 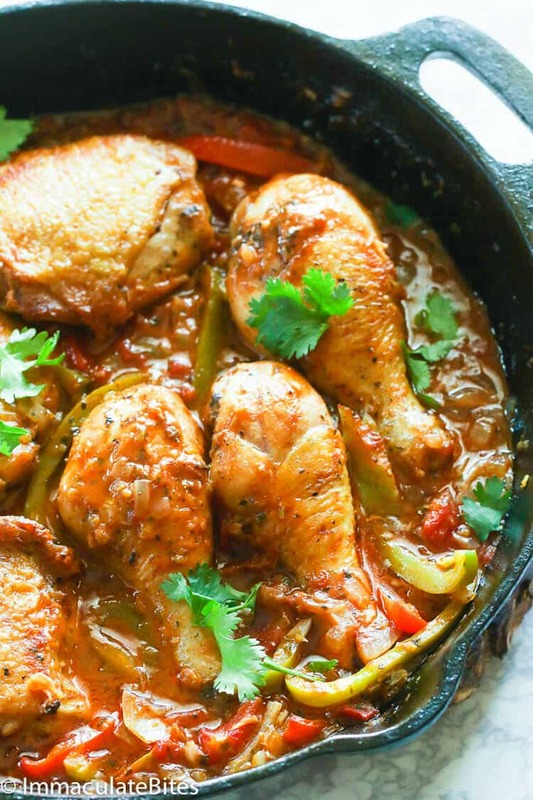 It makes a powerful base for dishes like stews, beans and rice with different variations among the Caribbean, Latin America and other Spanish-speaking countries. I grew up believing that homemade seasoning is always a winning ingredient for serious home cooks. Unlike store-bought spices and seasonings, homemade seasonings can be adjusted according to your preference and you know what and how much goes into that mix. 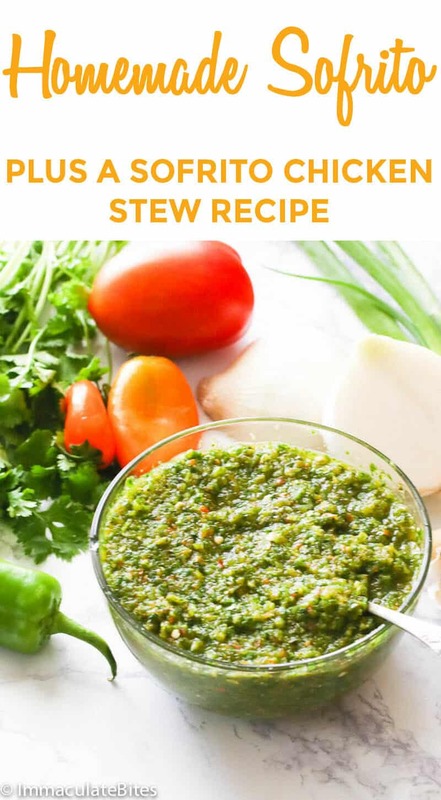 Sofrito is a sauce or green puree of vegetables and herbs blended together to form as a flavorful base on dishes especially in Puerto Rican dish and pretty popular in in the Caribbeans and Spanish speaking countries . It goes by different names with variety of preparations and mixture of ingredients. 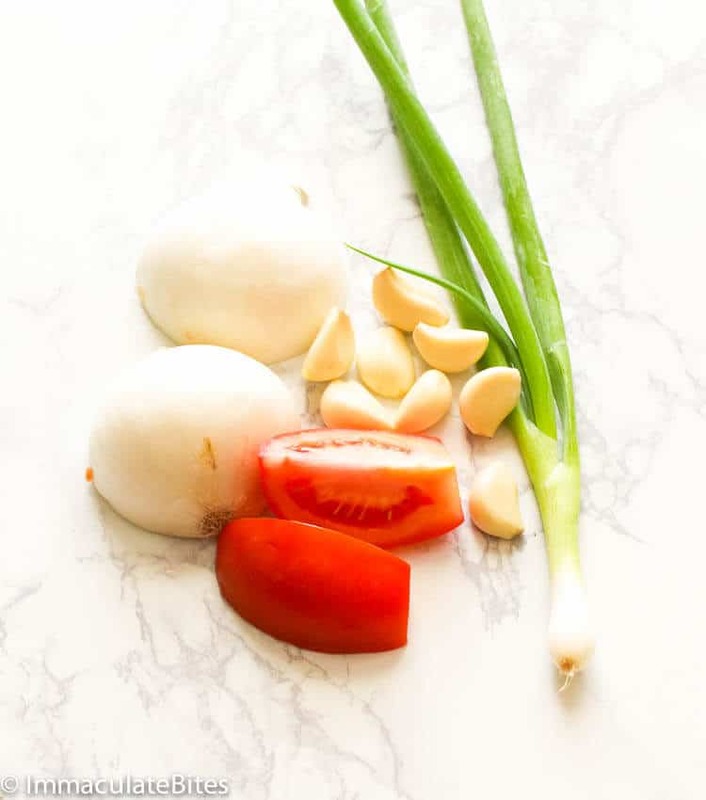 What we have for today is the Puerto Rican Sofrito primarily made of culantro, cubanelle, bell peppers, garlic and onions – among others. 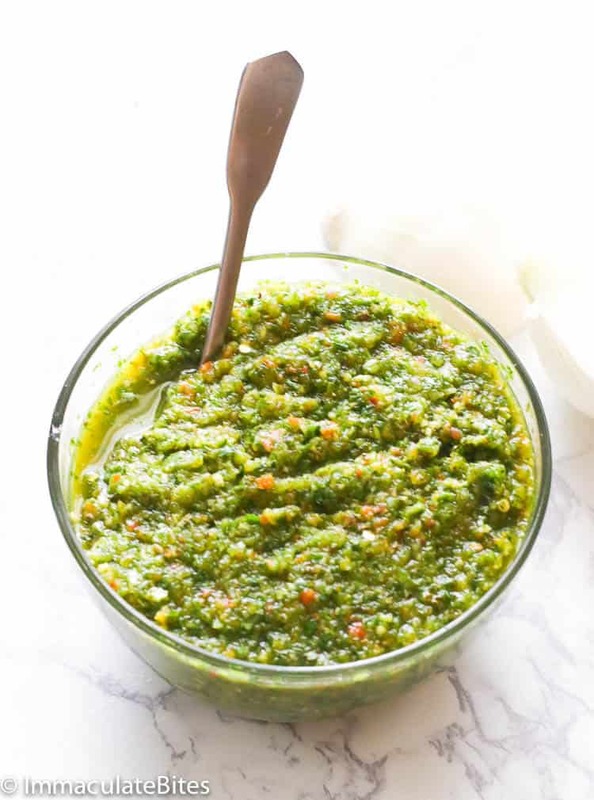 For sofrito purists out there, this one here is the most basic version which uses easy-to-find ingredients. It’s hard to come across cubanelle (small sweet peppers) in my neck of the words. 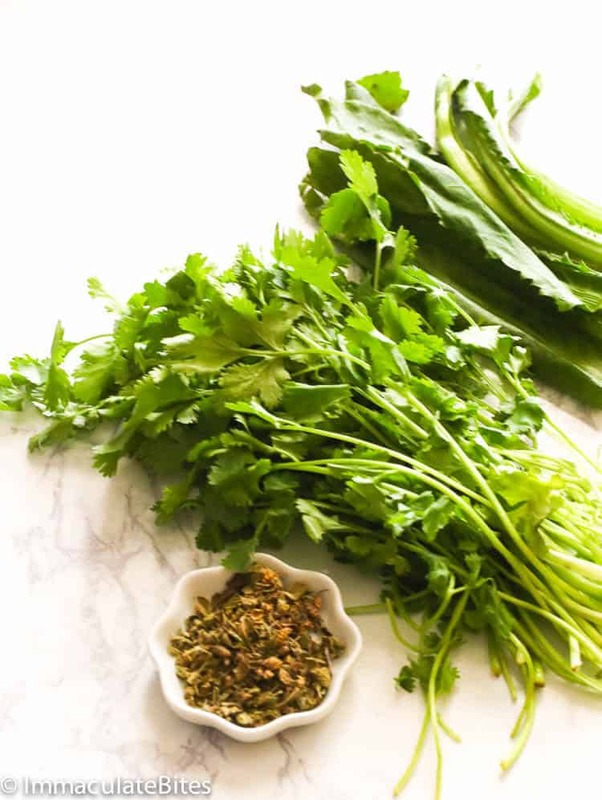 If you can’t find culantro, by all means just substitute it with the same amount of cilantro. For the aji dulce, a small Caribbean pepper which is slightly sweet but not spicy, you can leave it out when cooking or substitute it with green bell peppers like I did for this recipe. 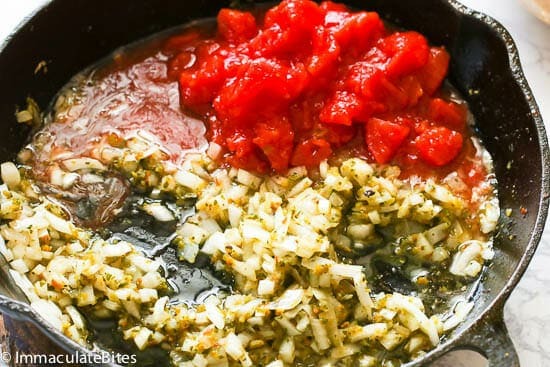 This sofrito sauce is so aromatic, fragrant and taste so good with a little kick in between. 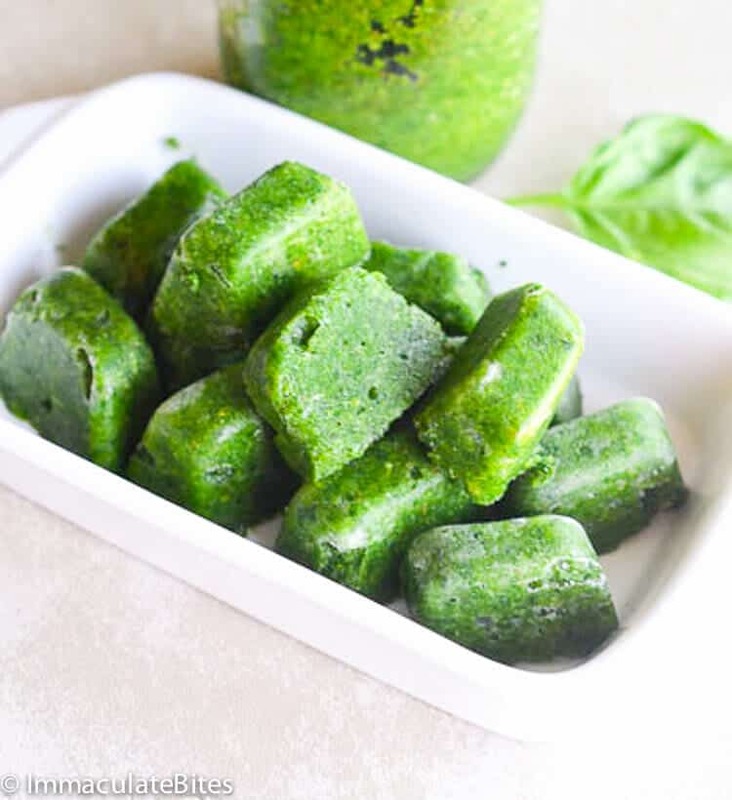 Once you have all the ingredients, you give all those vegetables and herbs a rough chop, place in a food processor and blend it until it turns out into a green puree. You can add a little bit of olive oil to help everything come together, but I prefer mine to have a bit of a texture, so leave out if you wish to. You can store it in a jar and place it in a fridge for up to 1 month or freeze it in ice cubes and place them in a freezer bag for up to a year. What do you use sofrito in? Some would also reach out for it to perk up eggs, steaks and also vegetable dishes. Or if you’re into chips, sofrito makes a great replacement as a dip like salsa. Now that you know the ins-and outs of this green puree blend, sofrito, it’s time that we put it into action. 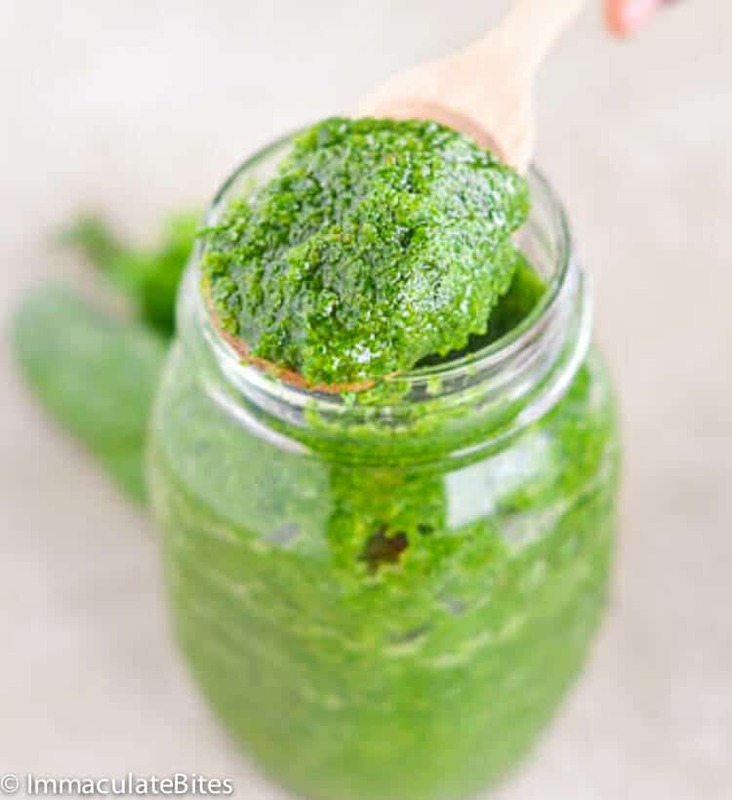 Just few tablespoons of sofrito and you’ll thank yourself later for taking time in making this sofrito recipe. 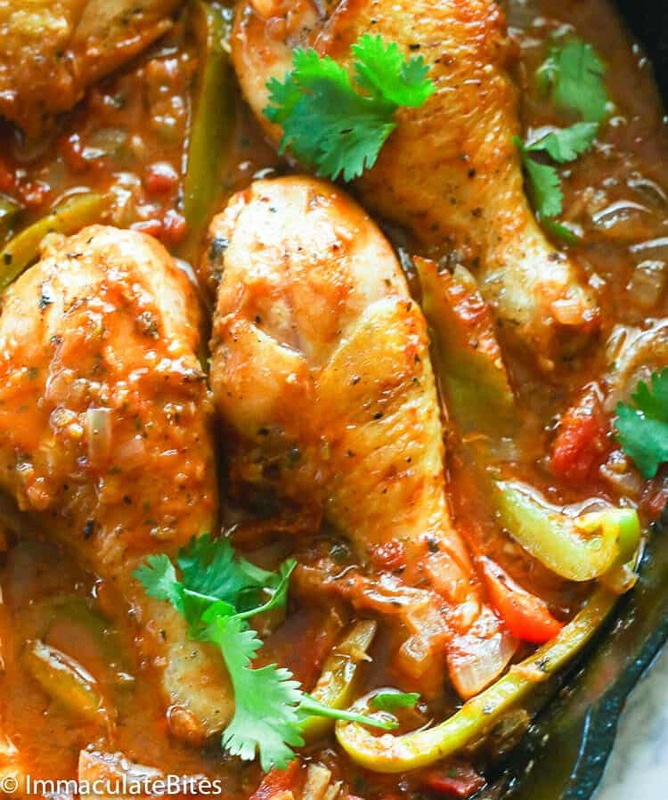 This Sofrito Chicken Stew recipe here is a tomato-sofrito based stew seasoned additionally with paprika, cumin and sazon to infuse aromatic and deep flavors into the chicken meat. And when I say “infuse”, I’m not taking it lightly. Your taste buds would be singing for joy, and I can guarantee you that it’ll be hard for you to stop once you start smothering your rice with that sofrito stew sauce. If you want to enjoy wonderful flavors in your dishes, don’t box yourself within the salt-and-pepper world. There’s so many great flavors that you can adapt from different countries. 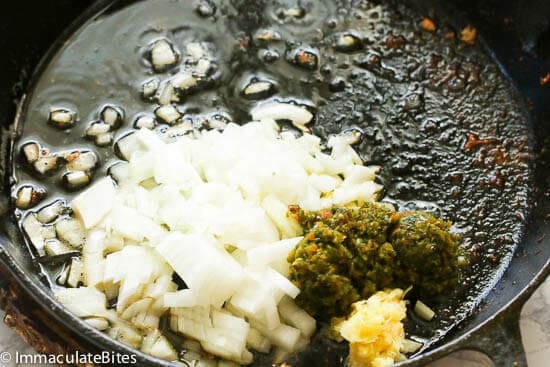 Here’s the West Indian Version of Sofrito (Green Seasoning)– enjoyed in Jamaica, Trinidad and other Caribbean countries. And they do hit the home run for me ALL the time. If you can’t find culantro, by all means just substitute it with the same amount of cilantro. 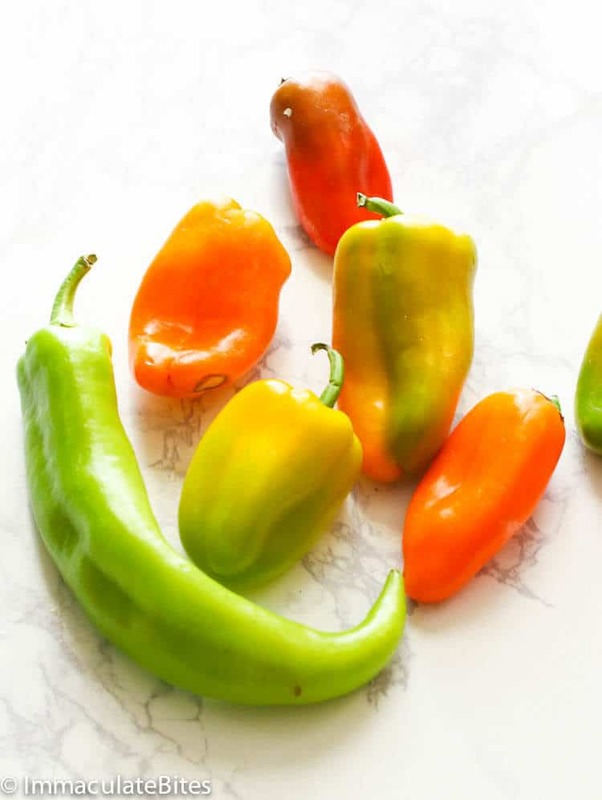 For the aji dulce, a small Caribbean pepper which is slightly sweet but not spicy, you can leave it out when cooking or substitute it with green bell peppers like I did for this recipe. You can add a little bit of olive oil to help everything come together, but I prefer mine to have a bit of a texture, so leave out if you wish to. 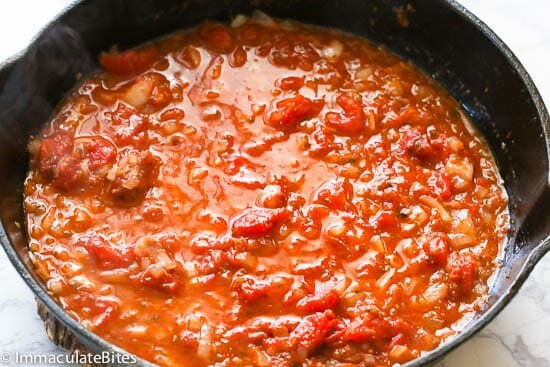 You can also use sofrito as a replacement for salsa. 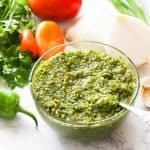 Sofrito Recipe - a versatile aromatic green puree made of bell peppers, tomatoes, cilantro, garlic and onions. 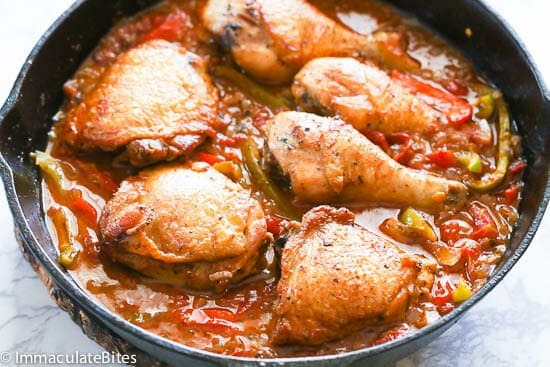 It makes a powerful base for dishes like this aromatic with a punch Sofrito Chicken Stew. A versatile homemade seasoning that is out-of-this-world! Add all ingredients to food processor. If desired, add enough water or oil enough to blend. (I don’t add liquid when using a food processor). Blend to desired texture. Store in an airtight glass jar in the refrigerator or freeze in ice cubes. 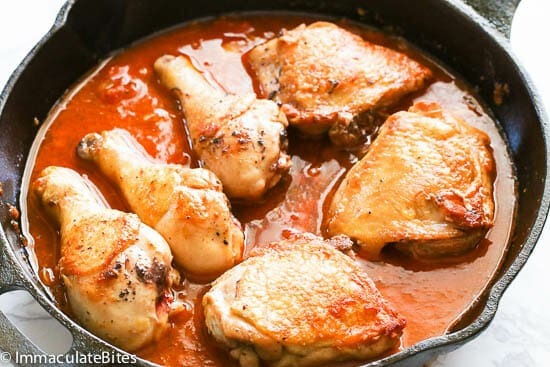 Wash chicken thighs and legs wipe with a paper towel. Pat chicken dry and season with salt and sazon. Season with salt. If desired, rub both sides with generous amount of sofrito blend and sazon. Or just use your favorite spice mix. Let it sit at room temperature at least 15 minutes and up to 1 hour ahead. You may refrigerate until ready to use . 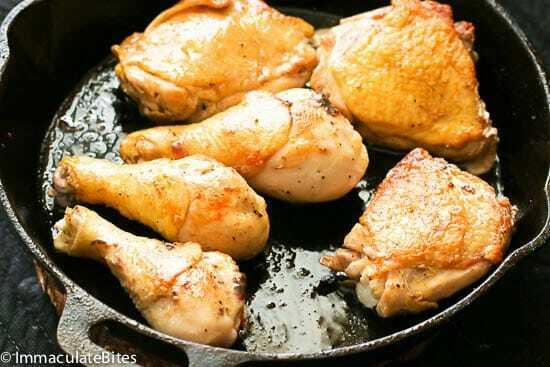 Heat up a dutch oven or skillet over medium high heat. Pour about 2 tablespoon oil. Place chicken skin side up, let it sear for about 2 minutes before turning chicken around. Cook for about 4-5 minutes on each side until brown . Transfer chicken to a plate, leaving drippings behind. Add about 2 tablespoons oil or more followed by onions, garlic, and sofrito. Sauté until soft but not golden, about 2-3 minutes. Then add tomatoes, cook for about 5 minutes. Next, add paprika, sazon, cumin, bell pepper and chicken broth. Return chicken back to the pot and bring to a boil and then lower temperature. Cook for about 30- 35 minutes or until chicken is fully cooked, add more stock/water as needed. Adjust seasoning to taste . Turn stove off and serve warm. Add about 2 tablespoons oil or more followed by onions, garlic, and sofrito. Sauté until soft but not golden, about 2-3 minutes. Then add tomatoes, cook for about 5 minutes. Next, add paprika, sazon, cumin, bell pepper and chicken broth. Return chicken back to the pot and bring to a boil and then lower temperature. Cook for about 30- 35 minutes or until chicken is fully cooked, add more stock/water as needed. Adjust seasoning to taste. Turn stove off and serve warm. How much rice should I use for the chicken with rice? I live in Maine and can’t find culantro. I might try growing it next summer. If I leave it out will it ruin the recipe? Hi, Colin. You can substitute it with the same amount of cilantro. Please do let me know how it turns out for you. Thanks. Didnt miss the culantro in mine . Thank you for this recipe. I’ll enjoy making my own, and it is a little spendy for how much they put in the container. Btw, I have enjoyed using refrito as well. I liked the ice-cube tray utilization. What a great idea. Pollo en fricase that how we call it. Very impressive recipe. Congrats! I think it is almost the same as mom’s recipe. Stew chicken! Thank you for this authentic flavor of the Puertorrican cuisine! Wepa! 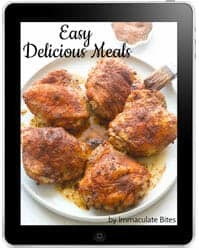 Gosh you are always on spot with these outstanding recipes… I cant say which is my favorite because I love all of them…My brother in law is from Nigeria and I love so much when he cooks. Do you have more African dishes you can share? Thank you for taking the time to share outstanding recipes!